Home › Latest News › Central Coast Olive Oil Competition Announces Winners! PASO ROBLES (CA) – The Central Coast Olive Oil Competition honored Geyserville based Dry Creek Olive Oil Company as the Best of Show in the 2017 competition. Calivirgin Coldani Olive Ranch based in Lodi received Best of Show for the flavored olive oil category and MoonShadow based in Paso Robles took home Best of Show for the organic olive oil category. Results of 105 olive oils entered from across California can be found at www.centralcoastwinecomp.com. Twelve Best of Class honors and 36 gold medals rounded out the top awards for the annual competition. 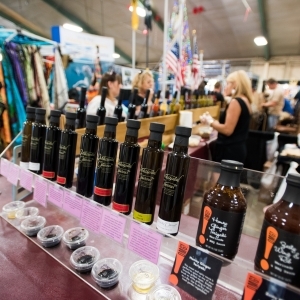 The Central Coast Olive Oil Competition, hosted annually by the California Mid-State Fair in partnership with the Lodi Grape Festival received 105 entries from 35 producers. Judges indicate the quality of entries improves each year. The winning oils will be featured during the California Mid-State Fair, July 19-30, 2017 and at the Lodi Grape Festival, September 14-17, 2017.